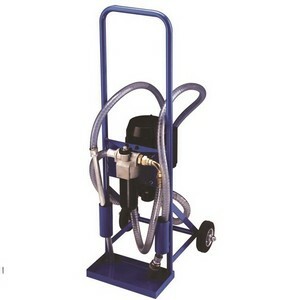 Hire the oil filtration and transfer pump for cleaning out contaminated oil and transferring oil. Our oil filtration system has a high dirt holding capacity coupled with a simple filter element change over. Whether it's the cleaning of contaminants such as metals from broken parts entering the oil system or general build up of dirt or even water in the oil our oil filter pump will do the job. As an added bonus the filtration pump can also be used as an oil transfer pump.